This edited collection examines changes in national security culture in the wake of international events that have threatened regional or global order, and analyses the effects of these divergent responses on international security. Tracing the links between national security cultures and preferred forms of security governance the work provides a systematic account of perceived security threats and the preferred methods of response with individual chapters on Canada, China, France, Germany, Italy, Japan, Mexico, Russia, UK and USA. 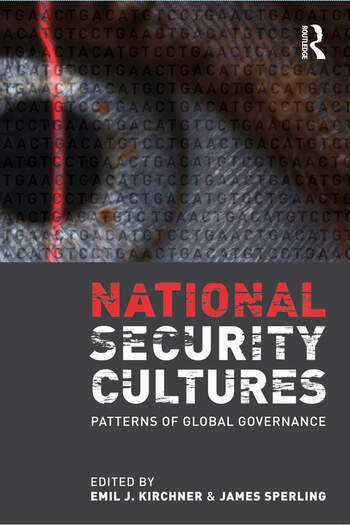 Each chapter is written to a common template exploring the role of national security cultures in shaping national responses to the four domains of security governance: prevention, assurance, protection and compellence. The volume provides an analytically coherent framework evaluating whether cooperation in security governance is likely to increase among major states, and if so, the extent to which this will follow either regional or global arrangements. By combining a theoretical framework with strong comparative case studies this volume contributes to the ongoing reconceptualization of security and definition of threat and provides a basis for reaching tentative conclusions about the prospects for global and regional security governance in the early 21st century. This makes it ideal reading for all students and policymakers with an interest in global security and comparative foreign and security policy. Emil J. Kirchner is Professor of European Studies and Jean Monnet Chair at the University of Essex. His current main interests include European security policy, regional and global governance, and cross-border cooperation. His recent publications include (co-authored) EU Security Governance (Manchester University Press 2007); (co-edited) Global Security Governance (Routledge 2007); (co-author) Studies on Policies and Policy Processes of the European Union (Law Press Renmin University 2003); (co-authored) ‘The New Security Threats in Europe: Theory and Evidence’, European Foreign Affaires Review 2002. James Sperling is Professor of Political Science at the University of Akron. His recent publications include (co-authored) EU Security Governance (Manchester University Press 2007); (co-edited) Global Security Governance (Routledge 2007) (editor) of Germany at 55: Berlin ist nicht Bonn? (Manchester University Press 2004) (coeditor) EU Enlargement and New Security Challenges in the Eastern Mediterranean (Intercollege Press 2004) and Limiting Institutions? The Challenge of Security Governance in Eurasia (Manchester University Press 2003).